With so many more people now living longer in private rental housing, security is becoming a much bigger issue for tenants and, therefore, landlords. But what are both parties’ rights when it comes to security equipment? Security equipment can give tenants peace of mind while living in a rental property. For landlords, offering a property with security equipment can make it stand out on the lettings market and add value to its rent price. So whose job is it to install the equipment and who can remove it? Essentially, it all stands in the tenancy agreement, explains Just Landlords, an award-winning provider of Landlord Insurance. For instance, if a landlord doesn’t want their tenant to install their own security equipment, this will have to be made clear in the contract signed by both parties. If a landlord is okay with a tenant putting in their own measures, but would like the property returning at the end of the agreement without such equipment, it must be stated. Five lever mortice lock for external timber doors, or a three multi-point locking system for PVCu external doors. Window locks on all windows easily accessible from outside (except designated escape windows). Burglar alarms, defender alarms, night-lights and spy-holes. In particular, locks and lights are known to make life difficult for burglars, and should help tenants feel safe and secure in their rental property. These are basic measures that should be installed in all rental properties. Make sure you know the access code.If a tenant changes the code, a clause must be written into the tenancy agreement that requires them to tell you the new code. Ensure you know how to use the system. If you want the property returning after the term has ended without the alarm, you must also write this into the tenancy agreement. The same goes for changing the locks on doors. If a landlord doesn’t want a tenant to change the locks, a clause must be added into the tenancy agreement that prohibits this. If a landlord doesn’t specify whether tenants can or can’t change the locks, they typically can. It’s also important to state in the agreement that, if a landlord does allow their tenants to change the locks, they must give them a key – that way, it’s a violation of the contract if they don’t. Between tenants, landlords aren’t legally required to change the locks on their property, but they might want to consider doing so; even if their previous tenant returned the keys to them, they don’t know for sure that they didn’t make extra keys. The only way to truly keep a property secure is to change the locks. If landlords don’t want to change the locks before a new tenant moves in, it’s a good idea to allow them to do so, as this will help them feel safer in their new home – just make sure they give you a key. 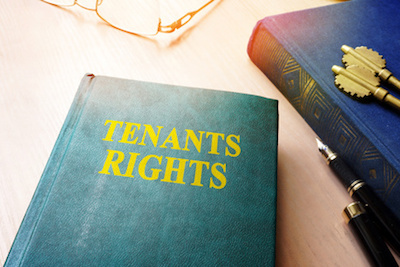 When it comes to tenants removing security equipment installed by their landlords, the tenancy agreement will typically state that the property must be returned to the landlord in the same condition as it was let in – this means that tenants cannot remove any equipment without the landlord’s consent. Any changes to the property – added either by the landlord or tenant – must be recorded and agreed by both parties. Safety and security is paramount for private tenants, and should be for their landlords, but all parties must understand their rights when it comes to installing security equipment.